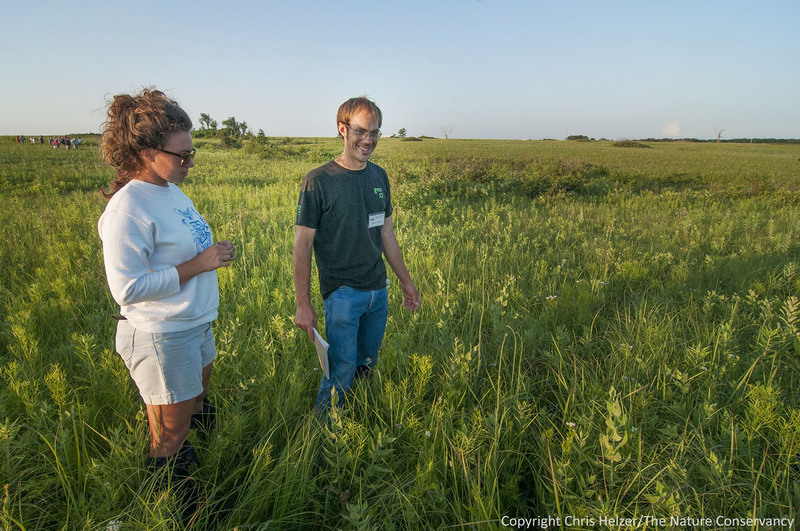 Hubbard Fellowship Blog – Why is Prairie Conservation Important? I arrived in Nebraska with romantic preconceptions of prairie, probably influenced by my mild obsession with Laura Ingalls Wilder as a child. Back then, I thought up designs for a covered wagon that would meet the cruelest of weather and environmental conditions—automatically elevating wagon-stilts, for example, to protect us from wildfires caused by lightning strikes—without sacrificing luxury. My wagon featured recliners for the driver and passenger seats, a loft outfitted with giant beanbag chairs for sleeping, and multiple TVs. We would be fully equipped to cross the endless grasslands, with extra storage space for our crates of never-rotting fresh produce and cereal. I won’t even get into the tree houses I devised at this age. Unsurprisingly, I was taken aback by the real prairie landscape, which was fenced off, bordered by large crop fields regularly showered in pesticides, and seemed to require constant tending – at least when we arrived at the height of thistle season. This disillusionment was valuable because it gave me a skepticism that has since faded, but challenged me to actively reflect on my role in this ecosystem, why I think it is important to protect, and what “protecting” it might really mean. Prairie landscapes are certainly striking, but many of those landscapes have been drastically changed so that actual prairie can be hard to find. My interest in the social and ethical facets of conservation make it especially important to me to be able to make a case to any audience for the importance, relevance, urgency, morality, etc. of conservation goals. In college, I studied plenty of abstract moral arguments on the relationship between humans and nature and what obligations we have toward nature, but now I want to hear from people about their personal perspectives on those issues. Because I’m new to grasslands, I have a different – and certainly still developing – relationship with prairie than those who have loved and/or worked on prairie for a long time. By now, I’ve asked several people why they feel it’s important to conserve prairies, and I’ve gotten answers ranging from a spiritual obligation to “steward the land,” a utilitarian need to conserve biodiversity, to the “intellectual challenge” prairie conservation offers, to name a few. I hope that as I gather new perspectives, I will be better equipped to engage with people on the significance of the work we do here on the Platte. Eliza (with Nelson Winkel) at Tucker Prairie near Columbia, Missouri during the summer of 2013. I think I’m asking two questions, though the answers may be the same for some: Why do you think it is important to conserve prairie, and why are you personally working to conserve prairie? This entry was posted in Prairie Management, Prairie Natural History, Prairie Photography and tagged eliza perry, grassland, great plains, hubbard fellowship, importance of prairie, nebraska, prairie, why is prairie important, why should we save prairie? by Chris Helzer. Bookmark the permalink. First, let me complement you and your colleagues on the professionalism and utility of your ongoing posts. I have undertaken this year to begin restoring a native prairie and bur oak savanna on the 100-acre farm I grew up on and have inherited, and you Prairie Ecologists have been a wonderful inspiration. I look forward to each submittal. As to your questions. I believe it is important to preserve all natural systems that are of their places–that reflect all of the unique forces that combine to make them what they are. In the case of prairies, the unique combination of climate, soils, topography, etc. that supports them is the same roster of resources most suitable for supporting human agriculture. Therefore, an understanding of the prairie is a gateway to discovering more sustainable practices in the environment that the original grassland and the current agricultural working landscape share. The prairies, apart from the biodiversity they support, once did and possibly can again, act as giant filters for water draining into the Missouri and Mississippi rivers, reducing pollution, dead zones, and warming in the Gulf of Mexico, thus helping to mitigate climate change. Perennialization (breeding perennial forms of annual grains) of grain crops and growing them in a setting mixed with prairie zones rather than a monoculture would also be helpful in this way, producing less runoff and erosion. The area I work in is fragmented, has degraded hydrology, vegetation diversity, and grazing systems don’t exist, except for continuous, intense. Tap this into a hot, humid, semi-tropical climate with recurring droughts and it’s difficult to convince folks to change from what is already established. the joy in watching people learn. Seeing them be able to start to identify various grasses that aren’t native to another continent, but are local, and adapted to our climate. Adjusting grazing and stocking regimes to better reflect what is sustainable rather than what is supposedly profitable. The added benefits of filtration, bio-diversity, wildlife habitat are secondary in my mind, but also very important. The greatest benefit is in getting folks to understand and appreciate the outdoors. The understanding that the weedy wildflowers, tall grasses, and plum thickets are beneficial, and not something to be mowed down and “cleaned up” to look presentable. Setting the perceptions of general society of a lawn being desirable aside, and embracing the natural growth of the land. All the while marveling at the variability in it’s responses to specific periodic management actions over the years. Thanks for starting what I think will be a wonderful discussion, or rather, perhaps a series of short monologues. I suspect I’m going to find something that resonates for me in every one of your respondents’ comments, Eliza, but perhaps the following will be distinct from what others post. The prairie provides both an intellectual and emotional connection for me. Since an early age, I have been a naturalist at heart, with a particular fondness for insects, and especially ants. AS a young adult, I even had a job for 8 years, in Florida, regarding which I like to claim that children were brought into this world, and my bills were paid for, by ants. I feel that I was truly born to it — a calling, if you will. At age 5, my elders jokingly used to call me the “bug-omologist”. I’ve always felt happier, more excited about life, simply better, when I have had access to places with diverse insect life. Prairies are good for that, although the dense vegetation hides so much of these small animals’ activity from view. The entomology of the prairie is punctuated with myriad question marks, an enduring and complex mystery, endlessly intriguing to me. Even more challenging for me is that my research specialty is ants, which in prairie are exclusively terrestrial critters (hard to be arboreal there). Why not pollinators, which fly about in plain sight, visiting pretty flowers? Well, they’re lovely, but ants are more interesting (to me). I’ve always thought, since my first view of a prairie remnant in northern Illinois as an undergraduate in college, that prairies were beautiful, but as a a person with a calling to study ants, it was these tiny animals that really got me “into” the prairie. You could say I “followed my bliss” into the prairie. I find the posts and comments on this blog so thoughtful and encouraging. I spent my dissertation working with forest birds, so like you, I am new to prairies. My reasons for accepting my current position as a post-doctoral researcher studying grassland birds were many, but it was in no small part because temperate grasslands are among the most threatened biomes on the planet. A paper was published this year showing that the current rate of habitat loss in the U.S. Western Corn Belt exceeds that of tropical deforestation, a process that dominated popular science media for a decade or more. A consequence of this habitat loss (and other factors) is that grassland birds have exhibited sharper population declines than any other avian guild in North America – a recent estimate placed population declines between 1966 and 2011 at ~37%. There is an ongoing debate in conservation science about how best to balance the needs of people and the other species that inhabit this planet. One aspect of the debate is whether conservation biologists are too full of doom and gloom, and whether the dire predictions that are the hallmark of the typical conservation-related scientific study do more harm than good. It is a debate that is worth having and one that forces me to be introspective about if/how my tendency towards pessimism influences my scientific objectivity. There are reasons to be hopeful about the future of grassland birds (and, of course, the grasslands on which they rely), but the threats they face are real and evolving; in addition to food agriculture we are now growing crops for biofuels, farming the wind, fracking shale, and so on. Understanding the degree to which these threats will impact birds and producing knowledge about what we can do to mitigate the threats is what inspired me to work in grassland systems. Andrew – Might you happen to have a pdf of the paper documenting grassland losses, mentioned above. Or a reference would do? Thanks, james.trager at gmail. The more I learn about each cog and wheel, the more fascinating the whole story becomes – from the tiniest bee up to the sprawling cosmos. If we are unconcerned with beauty… why bother getting out of bed each day? For me, conservation is all of the above: practical, spiritual, and aesthetic. It started out as a desire for a “roaming place” where I could free my mind and senses. What I did not anticipate was how much the abundance and interconnectedness of life on the prairie stirred the life in my soul. It is where I feel most alive and therefore most a part of life. The song of the seasons constantly beckons me, keeps me looking forward, always in anticipation. It never gets old, even as I age. What I see now is hopefully a legacy for others to find the same things I did not seek, but found, simply through the act of working in active stewardship of the land. I hugely enjoyed both of the essays and all of the responses above. Then I thought of my own reasons for wanting to preserve and restore prairie — a movement that exists even here in Texas, not a state known for forward-looking and socially responsible activities. My own hometown of Arlington, a city of 380,000 buried in the center of the DFW metro area of more than 6 million people, has a small, but cherished, bit of blackland prairie that dedicated teams of volunteers tend carefully to keep it from vanishing under invasive species or being degraded by adjacent public use. And we try to educate others in the City and area about why we do this. I think for me it’s also a bit of a guilt trip. My family on both sides were among the first settlers in southern Illinois, northwest and southwest Missouri, all over Iowa and west through Nebraska as far as the sandhills, breaking sod for all they were worth in the effort to create European-style farms on the pristine prairie. Most of them went broke trying, but in the meanwhile were able to raise several generations of prairie dwellers who mostly have now moved to cities like Arlington where we tell tales about our pioneer forefathers without thinking much about what they did to the land they settled. I’m glad to see prairie restoration work being done in all of the states where my ancestors farmed. One of the results of generations growing upon the prairie was that we all learned to love the very grasslands we were largely destroying. My father in his later years led groups on hikes over the Kansas Flint Hills, teaching them about the wildlife and plants that have survived in that huge unplowable area. He first learned that lore growing up in the red hills area of northwestern Oklahoma, and his father before him in the Loess Hills of southwestern Iowa. Again, thanks for all you do, and keep the faith! I see the prairie as a metaphor for freedom and democracy. If we allow prairie ecosystems to thrive, to do what they do how they do when they do, it reflects something back to us — encourages our freedoms (of course that means biodiversity, backup eco processes, pollinators, clean water, etc). If we do away with our natural heritage, we cease to be America on many levels, ethically and politically and culturally. Maybe I’m not giving you anything new here. We work hard to divorce ourselves from place, and we live lives then that are more disenchanted and sick, never thinking how easy it could be to walk our lives awake and truly alive. Prairie’s not the only way, but it’s our way out here (sure isn’t corn or beef). Ms. Perry, The reason I think it is important to conserve prairie is because most people from the prairie states have never even seen one. I lived my middle school and high school years in a small town on the Des Moines Lobe in Iowa. Just about every square inch of level ground was in corn. The only areas not plowed were the steep slopes along the rivers. However, even these steep slopes did not escape the degradation of over grazing. The whole business of drawing every last dollar out of the land is a catastrophe. The term ecological desert comes to mind. The saddest part is this condition has now persisted so long that new generations cannot remember anything different. So, “Why am I personally working to conserve prairie?” After being directed to small bits of remnant prairie, I discovered what had been taken from me. I now see the potential of degraded lands that have been set aside as “preserves.” Now that I know the true potential of these places I cannot be satisfied by their miserable state. I choose to help conserve prairies because I know my little piece of the world can be better. I also know the only way this can happen is if I roll up my sleeves and get to work. Protecting the environment means we need to find a balance between what humans need and what nature needs. It can’t just go one way or the other.